This is an amusing, fun show that doesn't require any thinking on the part of its audience. Perfect for watching to relieve stress. Be warned, there is lewd subject matter, some cursing, and mild violence. It's not really something that should be shown to children under 12. I really liked this show's willingness to break boundaries (ex. no problems with hitting girls). It's a very entertaining show. I would definitely watch it when season 2 comes out. I love these characters although I wish they had more time to do more of those fun skits in each episode. I was kinda disappointed at the last episode, though. I would have preferred to watch more skits rather than spending the whole episode on an origins story. So I was a little hesitant to say the least about this one. I mean, with a premise like this, it was either going to be comedy gold or a trainwreck, and honestly it's kind of both and I love it. The comedy. while on the violent, Looney Tunes side, is enjoyable. The characters are a delightful mixed bag of absurd, charming, relatable, and too pure for this show. Overall, if you're into more physical-based comedy, I highly recommend it. Aho Girl is exactly what is says on the tin. 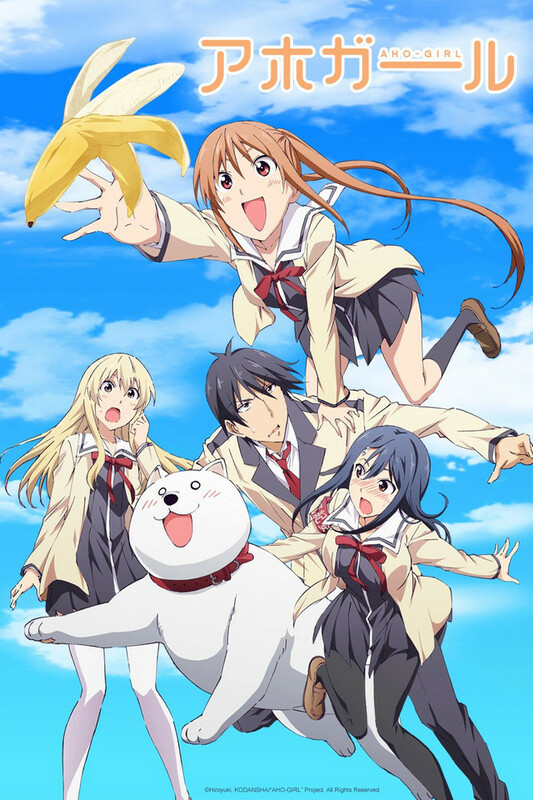 Despite it supposed to being a over the top comedy and all, this is probably the first comedic anime I have seen in my life that makes me wanna ask. “Hey!? Where did that brain cell go?” It truly is stupid, but I do know people enjoy non-stop what am I even watching comedy. If you didn’t realize by now, there’s nothing to talk about this one. At most I can say is that if you like stupid people doing stupid things and banana “jokes” everywhere and a focus on kid of straight man comedy with minimal effort. Not for me, maybe for you. 1.) Yoshiko is tons of fun. I always looked forward to seeing just how her stupidity was handled in every episode and how it was played off of the other characters. 2.) I found a lot of the machine gun humor to be worth at least a chuckle, at most manic laughter. 3.) There is a dog named Dog. He is a good boy. 1.) There's no real starting point or finish line. There are a few consistent plot points but no overarching plot. Stuff just seems to happen most of the time. 2.) The side characters--though enjoyable enough as a cooldown between Yoshiko's bouts of madness--are largely one-note characters. 3.) A hefty portion of the series just feels like it's aiming for par, from average animation to mandatory beach episodes. The opening is also the laziest I've ever seen, episode-to-episode variants be damned. It's not a very long anime, you have 12 episodes that go on for 12 minutes. If you plan to watch Aho-girl just keep in mind that it's humor is bizarre. It's nothing super crazy, but it's not something I would recommend if you aren't familiar with anime. It can be cringy at times, and something that may get old to people is when the main character punches the other main character. It's done in every episode and that can be obnoxious to see. That's all I can really say, check out the first few episodes and see how you feel about it. And well if it ain't your cup of tea, move onto something else.